Learning to Read Maps Obsolete? Everyone in my generation learned to read maps somehow. It wasn’t something taught is school. We had to learn this important life skill from our parents or maybe from Boy Scouts or in the miitary. I think if you went into the military and did not already know how to read a map you might have been at a huge disadvantage with the others there for training, but maybe i’m wrong about that. I learned to read maps from my dad. We always went on road trips during summer vacations. It was nothing to load us kids up in the family Chevy wagon and head out to the beach or the mountains. Lots of times we didn’t have a reservation at a motel, we just headed out and took our chances that we would find something that looked good and had a room for us. Now the cell phones and cars all have GPS units and we don’t have to really read maps any longer. I wonder if that is going to make reading maps an obsolete skill? If we can rely on GPS to get us to the destination, what’s the point in having paper maps any longer? Do we even need a compass any longer? This weekend might mean Mother’s Day to most people, but to fans of airplanes and the military, this weekend is Air Show Weekend. Last year was the return of the annual airshows to this area. They had to stop for several years because of funding and sponsorship problems. But they worked it out and came back last year. They always do the show in May, when the weather is mild and the not too hot to be standing on the tarmac for an entire day. Just a shame that they do it on Mother’s Day, as there are already a lot of traditional activities here tied into Mother’s Day celebrations. Last year’s show was a fantastic weekend, even though it rains for a short time in the middle of the show. This weekend will be very much like last year’s except that the Blue Angels will be flying this year. That will be a real treat. I can’t wait to watch them. Last year it was not the Blue Angels, it was the other flying team, the Thunderbirds. There is only one other flying team that performs at air shows in North America, the Canadian Forces Snowbirds. The fighter jets that they fly are the newest accomplishments of aviation engineering and military might. 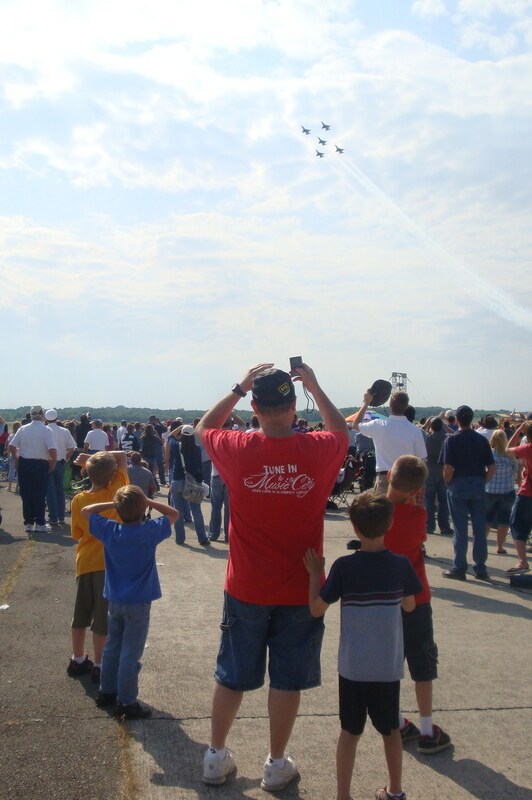 If you have a chance to attend an air show, it will be an impressive display and a memorable day for the entire family. One of the ladies at work had car trouble today so I tried to help her out. Melinda is a nice person and I don’t interact with her much on the job, but I didn’t mind helping her out. I have a pair of battery cables in the trunk and I gave her car a jump start. I told her to drive it at least 20 minutes without turning it off so the battery will have a chance to re-charge. I hope she got home OK.
Who Picked Out the Letters? Honesty in a vanity plate, as seen at the grocery store parking lot entrance. At first I was impressed with the way they worked their religious bent into their business. After all, we are living in the bible belt. So here is Christian Realty. That name itself should appeal to a lot of the people in these parts. 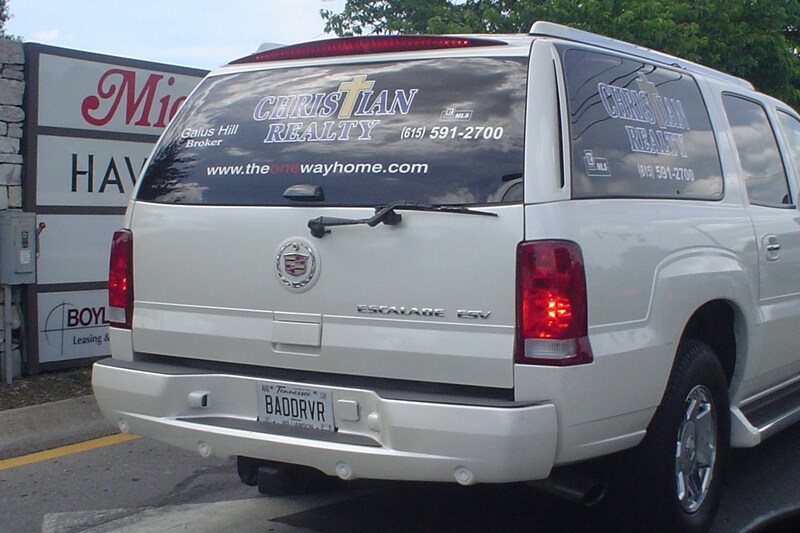 And they have a clever tag in their domain name as advertised on the back end of the SUV: The ONE way home dot com. Very clever. But now notice the letters on the license plate: BAD DRVR. At least they are honest.